Controlling your food costs starts with good inventory organisation and control. It has been found that a reduction in inventory levels and better organisation of food storage areas can have a significant reduction in food costs. There is a simple management saying: When you have excess and disorganisation you will have waste. The employee then rushes to the chef, who is extremely busy, and tells him we are out of croutons. Kitchen Staff were far too busy to leave and check the storeroom. That afternoon the first salesperson walked in the door first will get an order for croutons. (Forget price, we need them now!) Because we ran out the chef doubles the order to four boxes perhaps even higher? It is just a matter of time until someone stacks a couple of heavy cases of A10 beetroot cans on top of the those fragile crouton boxes. Before long and before you can use up all those croutons, you will have one or more boxes of crushed croutons bits and crumbs, bursting at the seams. This is a great example: Inadequate work station stocking before a rush period and poor food storage organisation that caused a massive panic in the middle of the lunch session. This resulted in panic ordering of excess inventory, without checking the price, which ultimately resulted in overstocking and potential spoilage. This can often be standard operating procedure for too many restaurants. In many instances eliminating some of the shelving and storage areas to encourage the kitchen to keep their inventory lean and mean. In some cases of extreme overstocking this alone has resulted in reducing food costs. Maintaining sensible stock levels can indirectly affect gross profit in many businesses. If a restaurant stocks too much of a product, selling just a small percentage of the total purchased in a given time period, the cost of goods may outweigh the total sales. On the other hand, ordering too few of an item could mean that you reduced cost of goods, but missed out on sales that could have been made. This too will reduce the gross profit, even though less money was spent up front. The ideal situation is use an ordering system that will have just the right amount of items arriving just in time for sale. This is a delicate balance that may take practice. Using more simplified Build to or Par levels simply do not stack up in today’s modern kitchens. Using a proven ordering system such as Abcom’s eProphet.NET will ensure that your stock levels are accurate and relevant to your forecasted sales. Stock requirements should be accurately calculated using contemporary usage figures. Abcom’s eProphet.NET utilises usage figures based on usage unit per $1000 of sales. Our comprehensive ordering system utilises mathematical algorithms and factors in recent raw item and stock amounts usage amounts and current inventory on hand. A reduced inventory will always ensure that new deliveries can be quickly stored away with sufficient shelf and storage space available. Reduced inventory keeps cartons off the floor and allow for faster and safer access to walkways and storage areas. Improves access and egress equates to good workplace health and safety practices and reduced hazards. A sensible level of inventory allows for shelving to be more regularly pulled out and cleaned behind and underneath in all storage areas. Cleaner restaurants mean less vermin and fewer visits from the Council Environmental and Health Officer. While Council and Environmental Health Departments have gotten tougher in this area, many restaurants still loose product to freezer burn, contamination and spoilage because of improper storage procedures. Even worse many of these restaurants will lose customers because they serve less than fresh meals. Do You Know How Much Improper Storage Is Costing You? After all your employees have left, take an inventory of everything in your freezer and walk-in that is not properly wrapped, covered or date marked. Now cost out the items that are still improperly stored. Multiply this by 365 days. Bet that number gets your attention. Give your kitchen crew a break by assuming that half of those items will be used up before they spoil. Chances are that even half of your annual spoilage cost will get you thinking what you could do with all that extra money. Check with your Commercial Kitchen Suppliers, perhaps they have purpose built dividers or signage to assist with product rotation? Green = Use First Red=Use last I have seen L shaped signs using this method to assist with rotation. The bookmark type signs are simply rotated 90’ to display the required action or information. Advance preparation can often have a critical impact on your food costs. Your kitchen staff may not worry about portion control when overwhelmed with orders during a rush. Advance preparation and pre portioning not only saves food cost dollars, it also results in a more efficient kitchen, with a more consistent product and faster service times to your valued customers. Do not let your employees change suppliers without your approval. Review the prices offered and check the quality of the sample before changing suppliers. Have a receiving procedure that checks price, quality and quantity at your back door. Exceptions can be noted on the back of the delivery docket and signed by the delivery driver, with appropriate management follow-up. Have your bookkeeper double check invoiced prices and quantities against quoted prices and amount ordered. More than potentially any other employee the dishwasher can share with you what is coming back from your dining room. How much of your food costs ends up going into the bins because of excessive portioning or perhaps just because customers do not like the entree, certain vegetables or a condiment? Modifying a garnish, eliminating a vegetable or reducing a portion may allow you to reduce the menu price, making you more price competitive with the same profit. Consider reducing the size of your mains serving plate. A huge portion or plated product may look inviting and may represent value in your mind; however, to a customer it may well represent potential overeating on their part. Once again your dishwasher is a valuable source of information, value their observations and above look, listen and take action. The back door is where a good portion of your profits escape, if you allow it. The most obvious solution is to always keep the back door locked at all times. This will require a door bell outside for deliveries. In addition fire regulations may require an emergency exit bar on the door. Be sure it includes an alarm that must be deactivated by management or designated kitchen personnel before the door can be opened. Keep the area outside your back door clean and tidy. As much as is possible you want to eliminate places where stolen items can be hidden from sight.. Check your rubbish bins. It is a common practice to conceal items and hide them in the outgoing rubbish runs. You may also realise considerable saving in cleaning chemicals, cutlery, and merchandise costs by checking the rubbish. When designing a new kitchen, locate your freezers and walk-ins, where you keep high cost items like meat and seafood, as far from the back door as possible. Always make it harder for thieves to sneak things out. 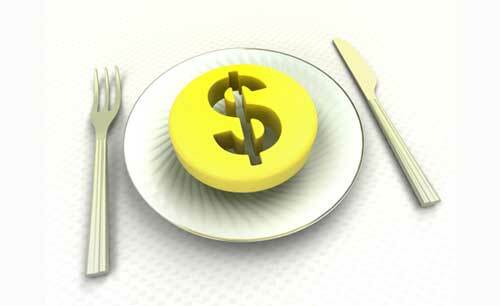 Just like everything else in your restaurant, you are the key to making food cost control work. I recommend always using the two person spot check system. Designate a key person with the authority to open the back door to check all rubbish before the dishwasher carries it out. If the rubbish inspector does his/her job theft will be reduced. Where possible try to have two people checking the rubbish to minimise opportunity for collusion. This is where management insures the rubbish inspector is doing his/her job. This is also where management gets their hands dirty and spot checks the garbage at unexpected times. This clearly establishes you are committed to controlling back door theft. It also proves that you do not ask your employees to do anything you will not do. Employee theft is something that most restaurant owners will encounter at one time or another. No matter how well you think you know your employees there is always a possibility of theft. Employee theft in restaurants takes many forms, including giving away free food and drinks to customers without authorisation, stealing customer’s credit card information and stealing food or alcohol for themselves. Many employees only steal because they know they can and their chances of getting caught are remote. If employees know you have a system in place to track theft, then most will respect that and not attempt to steal. In my opinion, security cameras are the obvious way of telling your staff “I don’t trust you” and not always good for employee morale. However, if theft is an ongoing problem, they may be the quickest and easiest solution. Always have signs posted adjacent to all your cameras indicating that they a continually recording. Avoid hiding cameras from public or staff view. Alcohol will vanish like magic if left unattended, so the best way to keep employees from stealing alcohol is to keep it under lock and key. Only the restaurant owner, managers and perhaps only key bar staff, have access to the supply. Like food, you should keep a comprehensive inventory of alcohol and check your Point of Sale system when a certain line of alcohol is often consistently running low. If there are no sales to account for the alcohol use, you can only assume that employees are either giving it away or keeping it for themselves. It will be ultimately your choice to prosecute. Taking little or no action will not solve the problem a soft stance will ensure a prompt return. Prosecution involves Police, statements and often a court appearance. If you are not 100% sure of the facts an ex employee that is exonerated may then pursue you in the Civil court system. Always been seen by your employees reviewing footage, this is always time well spent. The bluff: announce to all staff that you have been made aware of a number of thefts and you intend to catch the thief using information given to you. Occasionally staff will confess and leave, mostly they will leave your employ the very least they will simply cease stealing. Help your rubbish inspector and always provide gloves and apron for use while inspecting the garbage. Count, count, count and count some more. Perpetrators witnessing this constant vigilance will realise what is happening and will often cease their stealing. Periodically inspect rubbish yourself before it is taken through the back door. Consider locking you dumpster with a padlock overnight. You would be surprised how many employees have returned after hours to collect their “booty” from an unlocked dumpster. This also prevents homeless people from rummaging through waste and creating a huge mess overnight. Always work to improve and maintain great relationships with your staff, use this to communicate ongoing concerns such as theft and wastage. Encourage and invite them to be part of a solution and avoid the perception that they are all just part of the problem. You might just be surprised as to the observations even the most reserved staff person can make of operations and events, especially in your absence. 1. Deliver a high level of customer service. 2. Minimise the inventory levels. It is a proven fact that you it is difficult to achieve these two goals without the right solutions. You must computerise your inventory purchasing function in order to balance these two conflicting goals. Abcom’s eProphet.NET will effectively assist in controlling your inventory so you can then manage it. Good control is the mechanical task of maintaining accurate records. Management is the application of decision-making techniques to achieve the desired outcomes. If you are not using a proven software solution to analyse your inventory data and provide good restocking controls, you might as well head to the Pokies you might have better odds.